Black Self Defense Tactical Pen with Cheek Crusher | BUDK.com - Knives & Swords At The Lowest Prices! 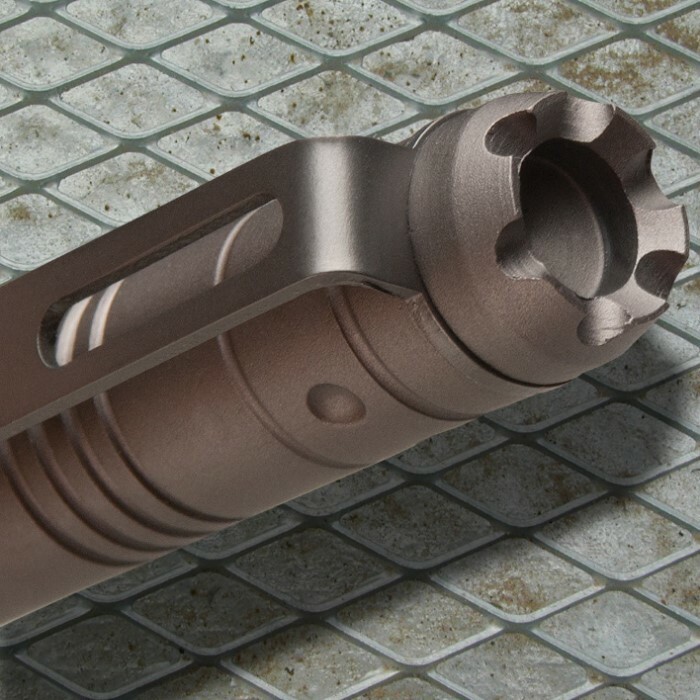 This duty ready tactical pen is constructed of aircraft grade 6061 aluminum and ready to take down attackers. Features an aggressively pointed end as well as a crusher impact crown at the top of the cap. Really awesome tactical pen. This is the first one I've ever had and I've got to say that I'm hooked on it. I work in marketing and use pens all day. This one stays clipped in the pocket of my slacks. Very durable yet lightweight. Cheek crusher has sharpened edges and is the real deal. I sure wouldn't want to get hit in the face with it (or anywhere else for that matter!) Oh, and it writes really well,too. Just makes me feel a lot more secure with this thing in your pocket all day long. This is a heavy pen. I fill out numerous work orders daily and I definitely feel the weight of the pen after a few. Otherwise, no complaints. Very well made of aluminum, high quality, writes smooth and I can see where it would be useful in an emergency situation. I like this pen. It is not only functional, it has a certain flair to it. Thanks BUDK !! Pen writes nice and seems very solid as far as self defence usage goes. No instructions on how to open the chamber to replace the ink cartridge. Will do some experimenting on that one. Got this and 3 other items. Shipped a week to Minnesota. Shipping is outrageus, almost half the price of the order. Would be nice if they offered different shipping options versus "ONLY" Fed Ex. I Bought This Pen As A Present And I Ended Up Keeping It For Myself. I Have Shown It To Alot Of People And They Love It!!!! Very Sturdy, Writes Real Good And In Black Ink. This Pen Will Make A Great Gift To Someone. good attention getter, ink don't last long, no info on cartridges to order refills. would be no problem states side. big problem over seas! I've had this pen for almost a year, and I must say that I am impressed. It's a sturdy tool and having it in my pocket makes me feel like I can beat the snot out of anyone who tries to assault me. However, the cap has lost friction with wear, and I've found that it comes detached from the pen while in my pocket. This means that there is a possibility that I will reach for the pen in an emergency situation and only pull out the cap, and that would be unacceptable. It's a great defense tool for the first year, but it does wear out. Greatest pen ever made !!!!!!!!!!!!!!!!!!!!!!!!!!! Nice sturdy pen great for at schools, work any where.!!!!!!!!!!!!!!!!!!! !.